The Tustin Planning Commission granted T-Mobile's request for an indefinite continuance at tonight's meeting. Basically, this gives T-Mobile the option of coming up with a new design and re-submitting it to the PC without having to formally start the application process all over again. T-Mobile has stated that they will be changing their design from the 65' fake tree tower originally proposed to a set of three 45' tall flagpoles to replace the two flagpoles that already exist in the turnaround area of the parking lot. Several members of our group, and a few concerned citizens, addressed the commissioners and reiterated that a cell tower of any sort would not be welcome in the park and that we would fight whatever design they propose. We also presented the commission with an additional 207 signed petition forms stating opposition to the tower installation. Stay tuned. We'll post news here as soon as we have anything new on T-Mobile's proposed design. After weeks of stating that they have already done the analysis on the OC Fire Authority cell site and that it will not work for their needs, TMobile began conducting actual tests today to verify the signal strength at Cedar Grove Park and the OCFA site. 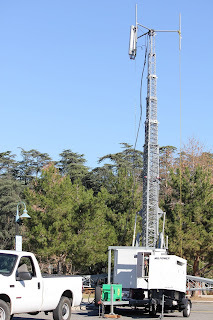 Many of you may have seen the large tower erected in the Cedar Grove parking lot today to conduct these tests. Well, that's just a taste of what a tower in the park would look like! It's interesting to note that they chose to erect the tower in the parking lot, not up at the end of the park where the tower installation is actually going to be. Is it because if they tested up there they would actually get a poorer reading? And what conclusions can be drawn from a test that doesn't actually simulate the real location? They have been telling us over and over that changing the height or the location of the antenna by as little as a few feet can have a drastic impact on the coverage for a given location. 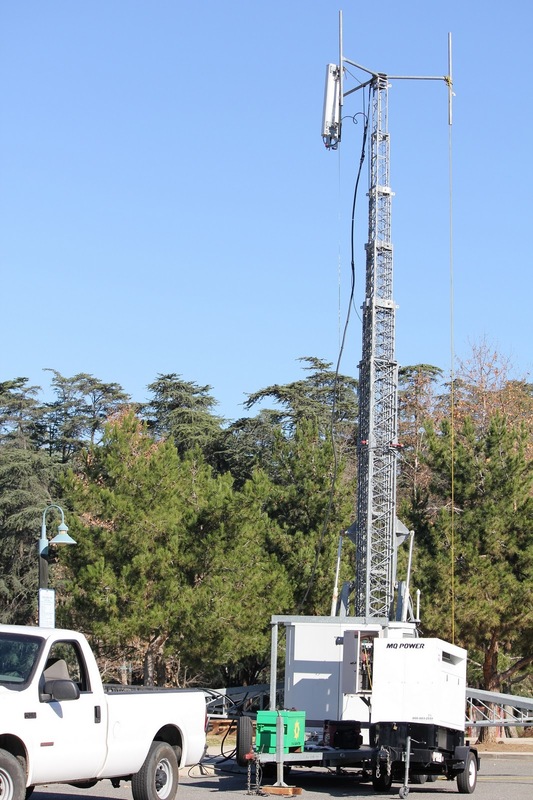 Currently T-Mobile claims that the OCFA site is inferior to the Cedar Grove site because their antennas at OCFA would be five feet lower than at Cedar Grove Park. Five feet! So what are we to believe? Don't forget - the Planning Commission Hearing is next Tuesday, January 25th! The T-Mobile representatives sounded like a broken record last night at the Open House they conducted concerning the proposed cell installation in Cedar Grove Park. They had several tables set up to "educate" the community on the various aspects of the installation - design, coverage, technology, and safety. They didn't have any new information to provide regarding the viability of the alternative OC Fire Authority site - even though we have been asking to see that analysis since the Planning Commission hearing on December 14. They just kept saying "The Cedar Grove site is the only site in the area that will give us the proper coverage." When asked where the data was that showed that the OCFA site would not work they claimed their RF engineer (who unfortunately could not make it to the meeting last night) had it, but, for some reason, it just wasn't available for the meeting. They claimed that the OCFA site would be a good candidate to serve other areas, but declined to specify what those areas might be. And when asked if that meant that they would like to be in both locations, Cedar Grove and the OCFA, they said YES! Wait, did I hear them right? They now want TWO towers in our neighborhood???? How much more ludicrous can this get??? Stay tuned to this blog for additional info. In the mean time - mark your calendar for January 25th, 7pm. That's the date of the next Planning Commission meeting. We need to show up there in force to convince the Planning Commission that we will not give up until this tower is DEAD!